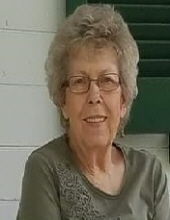 Brenda Joyce (Doyle) Desper, 74, wife of Raymond Desper of Foxfield Drive, Staunton passed away on Saturday, April 6, 2019. As she entered her heavenly rest she was surrounded by her loving family and caring staff of the Augusta Health Intensive Care Unit. Mrs. Desper was born on May 30, 1944 in Greenville, Virginia, the youngest daughter of Jesse and Annie Byrd (Floyd) Doyle. She grew up in Staunton and graduated from Robert E. Lee High School. She was a homemaker of incredible dedication and talent. Drying flowers, macramé, crocheted afghans, quilting, flocking her neighbors’ Christmas trees, and growing mounding beds of Petunias were just a few of her talents. Her misplaced Cream Cheese Cookie recipe has been a loss at Christmas without a successful replacement. She was a member of the Mint Spring United Methodist Church. Throughout her life Mrs. Desper offered herself in Christian service as a Choir member, Youth Counselor, Sunday School Teacher, United Methodist Women President and Board member. She volunteered for the Pregnancy Help Center in Staunton, and worked alongside her husband at Staunton Building Supply. In addition to her parents Mrs. Desper was preceded in death by her five sisters: Mrs. Virginia Dunn, Mrs. Violet Wiseman, Mrs. Shirley Marshall, Mrs. Wilma Fitzgerald, and Mrs. Sue Doyle. Also preceding her in death were her brothers-in-law and sisters-in-law, Mr. Thomas Desper, Mr. Bobby Shipe, Mrs. Louise Shipe and Mrs. Delores Hale. Many have lived in the warmth of her understanding and she will be missed by her family and friends. The family will receive friends from 6:00 p.m. until 8:00 p.m. Wednesday, April 10, 2019 at Coffman Funeral Home and Crematory in Staunton. A Graveside Service will be conducted 11:00 a.m. Thursday, April 11, 2019 at the Oaklawn Memory Gardens on Shutterlee Mill Road, Staunton by the Reverend Ryan Oswald. Memorial Donations, in honor of Mrs. Desper, may be made to the charity of your choice. To send flowers or a remembrance gift to the family of Brenda Joyce (Doyle) Desper, please visit our Tribute Store. "Email Address" would like to share the life celebration of Brenda Joyce (Doyle) Desper. Click on the "link" to go to share a favorite memory or leave a condolence message for the family.